This beautiful pond garden of Tenryu-ji is esteemed as one of the best masterpieces in the art of landscaping in Japan. This Zen garden was originally designed by Muso Soseki in the 15th century so as to artistically represent the state of enlightenment (Satori) which a Zen monk finally experiences. 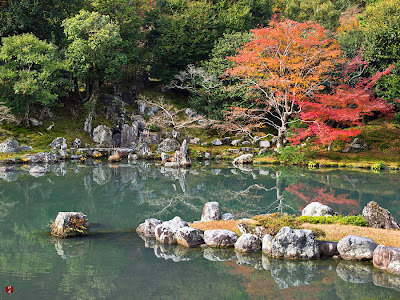 This pond is called "Sogen-chi," which is derived from the Zen word "Sogen no itteki sui" which means that a droplet of water finally makes the vast ocean. The arrangement of rocks in the back is presenting the landscape of a waterfall, which symbolizes "Toryu-mon" of Chinese legend. Toryu-mon means "a gateway for changing into a dragon." A carp can become a dragon by climbing over this towering waterfall.